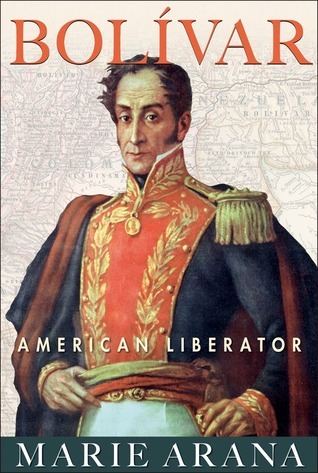 It is astonishing that Simón Bolívar, the great Liberator of South America, is not better known in the United States. He freed six countries from Spanish rule, traveled more than 75,000 miles on horseback to do so, and became the greatest figure in Latin American history. His life is epic, heroic, straight out of Hollywood: he fought battle after battle in punishing terrain, forged uncertain coalitions of competing forces and races, lost his beautiful wife soon after they married and never remarried (although he did have a succession of mistresses, including one who held up the revolution and another who saved his life), and he died relatively young, uncertain whether his achievements would endure. Drawing on a wealth of primary documents, novelist and journalist Marie Arana brilliantly captures early nineteenth-century South America and the explosive tensions that helped revolutionize Bolívar. In 1813 he launched a campaign for the independence of Colombia and Venezuela, commencing a dazzling career that would take him across the rugged terrain of South America, from Amazon jungles to the Andes mountains. From his battlefield victories to his ill-fated marriage and legendary love affairs, Bolívar emerges as a man of many facets: fearless general, brilliant strategist, consummate diplomat, passionate abolitionist, gifted writer, and flawed politician. A major work of history, Bolívar colorfully portrays a dramatic life even as it explains the rivalries and complications that bedeviled Bolívar’s tragic last days. It is also a stirring declaration of what it means to be a South American. Marie Arana was born in Lima, Peru. She is the author of the memoir American Chica, a finalist for the National Book Award; two novels, Cellophane and Lima Nights; and The Writing Life, a collection from her well-known column for The Washington Post. She lives in Washington, D.C., and Lima, Peru. This giveaway is sponsored by the publisher and one book is available. I love history! I have always wanted to learn more about Bolivar. Was a history major in college so this book definitely appeals to me. :) Thanks for the chance to win a copy. I love reading History. I also like to read the history of other countries. I remember hearing Bolivar's name in school, but I don't remember much of anything the teacher taught. Would love to read this book. It's a special one.